In previous posts, I showed measurements of the power draw of Consumer (C-class) HDDs, in both standard and staggered start-up. In this post, I'm showing the same power draw tests, but this time with Enterprise (E-class) HDDs! 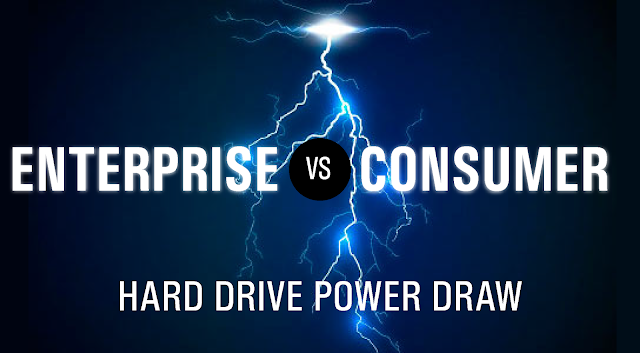 First of all, before we get into the fun stuff on power draw, let’s clear up some of the mystery of enterprise drives. You may be wondering, “I’ve heard E-drives might not be all that better, aren't E-class drives just the same old drive with a higher price tag and longer warranty?" These suspicions and rumours have been stoked by certain sources (Backblaze or Google) who have been saying C-class drives are just as good. Well, we believe that is misleading, and what Backblaze and Google say is true, but their assertions are very specific to their own highly specialized applications. The two classes of drives are meant for different applications, and because of that, each are specifically designed and manufactured to address the certain design criteria required. Consumer-class drives are meant to be used in a light to moderate workload, typically only needing to serve a single user’s needs, and are not meant to be running 24/7. On the other hand, enterprise-class drives are made to run at higher workload, 24 hours a day, 7 days week, and serve (depending on the server) thousands of users. ('Workload' refers to the amount of data transferred to and from the drive, typically specified in Terabytes per month). Since E-class drives are meant to be used in such heavy working conditions, and need to serve a great number of users, they are specially built with high-quality materials, comprehensive firmware, and error correcting mechanisms to ensure there is no data loss and very minimal downtime. However, all these fancy features are expensive and unnecessary for anyone not using them in a high-availability server, such as a home computer, small personal NAS or cold storage. This is where C-class drives are useful. The manufacturers strip away all the expensive pieces of the enterprise drives, and are left with what they call C-class drives, which come with the nice feature of a small price tag. Don’t read that as a slight to C-class drives, as they are perfectly suited for the application for which they are designed, and can still be used in the place of E-class drives. But you will find yourself replacing a lot of drives in your high-availability server. · Dedicated closed loop feedback from the drive head, with input from rotational vibration sensors so that the drive can account for write head mis-alignment. One last important note regarding the differences between E-class drives and C-class drives is power consumption. Due to the higher-quality electronic payload and mechanical equipment on each E-class drive, they pull more power during start-up and operating conditions than their consumer class cousins. I hope that shed some light on the key differences between C-class drives and E-class drives, and with that out of the way, it’s time for the fun stuff. Current plots! I used the same exact setup as in my two previous posts, using a clamp current meter (MTP iC-410 AC/DC) and measuring first the 12V lines, and then the 5V lines that run to the HDDs. The output of the current meter was fed through a signal conditioning circuit and then observed on an oscilloscope. To generate the plots in this post, a python script was used to pull the data off the scope and was saved for analysis. This time, instead of using the consumer drives, I used 45 Western Digital Re Enterprise Class (Model# WD6001FSYZ) drives in a RAID0, in a standard StorinatorS45 pod. Our PSU is a Zippy 950W N+1 3 module redundant supply with active-active components. Interestingly enough (and not surprising), is that platter speed has a large effect on initial start-up surge. In my previous post, the consumer drives I used (Seagate ST4000) had its platters spin at 5900rpm, and because of this, the power draw differences between the C-drives from past posts and the E-drives in this post are a little exaggerated as these E-class drives spin at 7200rpm. 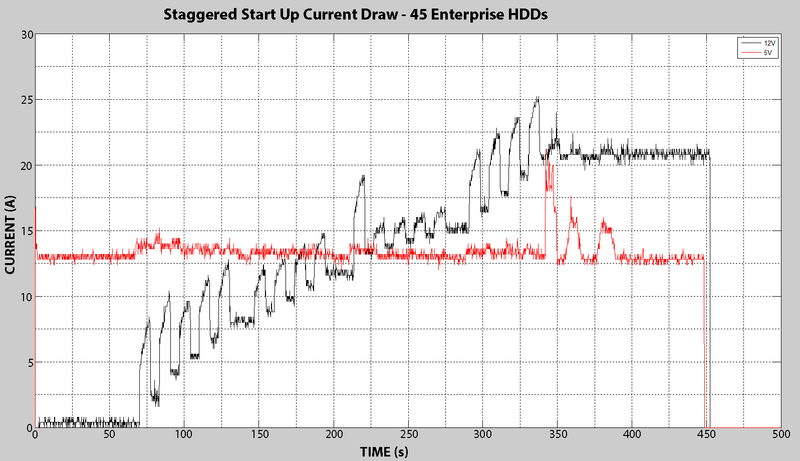 The following plot is the 12V line (black) and the 5V line (red) to the HDDs during start-up without staggered spin-up enabled. 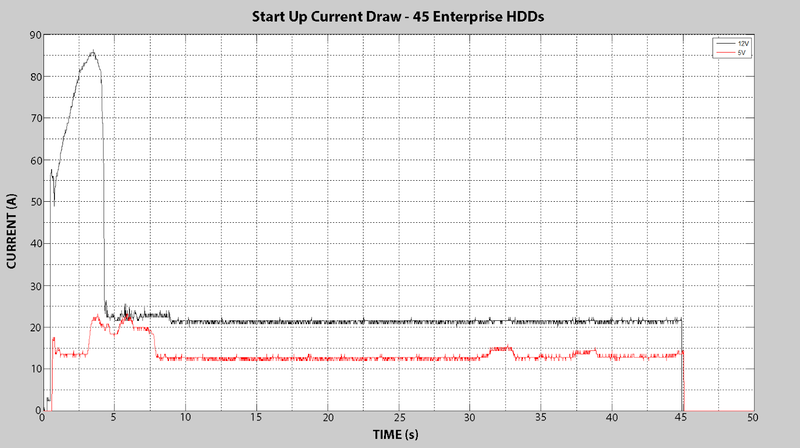 45 Enterprise Class HDDs under normal start-up conditions. The 12V line is black and the 5V line is red. You can see under normal start conditions 45 E-class HDDs pull a whooping 86A. You can see the enormous peak of current on the 12V line maxing out at 86A before falling very quickly down to a steady state value of 21A. You can see some activity on the 5V line as it initializes the drives and it falls to its steady state value 13A. This is obviously a lot for the PSU to handle (and in terms of the 60 drives for the XL60, too much to handle), it becomes evident that staggered spin-up is recommended when starting 45 or more 7200rpm or greater E-class HDDs. 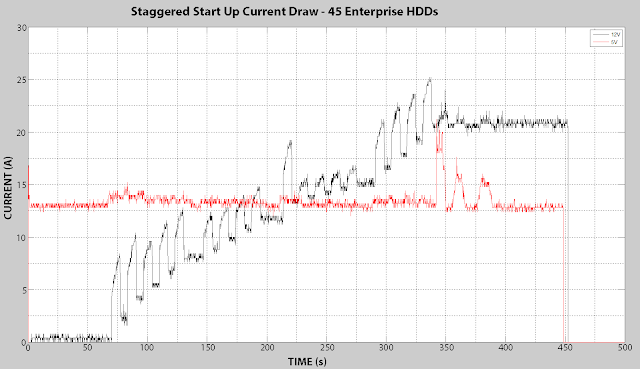 Below is the plot of the 12V line (black) and 5V line (red) during start up with Staggered Spin-Up enabled. 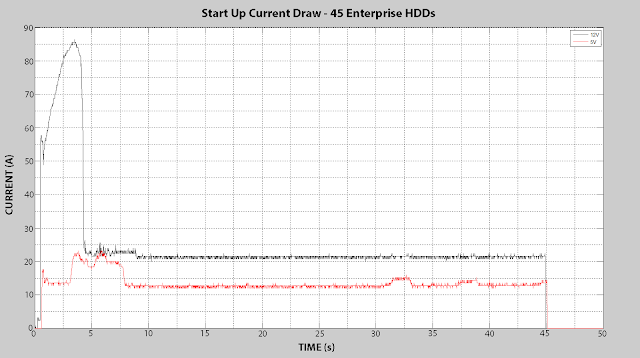 45 Enterprise Class HDDs under staggered start-up conditions. The 12V line is black and the 5V line is red. You can see that with SSU enabled the current draw has been greatly reduced. For the first 55s there is very little current pulled on the 12V line, while the 5V line starts at its steady state value of 13A. Once the card starts spinning up the drives at around 55s, you can see the 12V line increases linearly, climbing from 0A to 21A over 300s, while the 5V line decreases linearly (however, very slowly). Interestingly enough, compared to my previous post, these E-class drives don’t exhibit as clear plots like the consumer drives do. While the 12V line looks similar to the C-class SSU, you cannot see the separation of the cards as easily. Also, unlike the C-class drives where the 5V line falls significantly as the 12V line increases, the E-class drives don’t see their 5V line vary much from its steady state value. At 340s, the last drive is spun up and the 12V line falls to its steady state value. Once the drives are done spinning up, you can see three final peaks on the 5V line before it settles to steady state. Comparison of the 12V lines under normal start up conditions (red) against staggered spin-up (black). The above plot further reiterates how important enabling staggered spin-up is when using drives of this type. It shows a comparison of the 12V line during normal start-up (red) with the 12V line during staggered spin-up (black). Without SSU, the peak is 86A, and with SSU the peak is only 25A, a reduction of 71%. 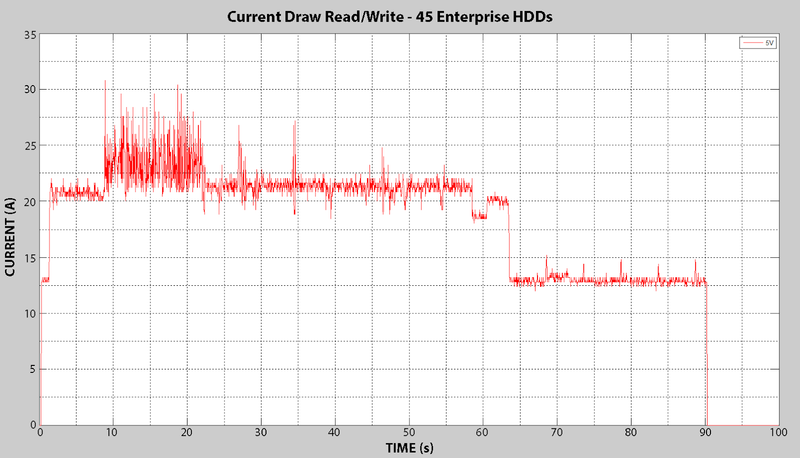 Current draw of the 5V during the creation of a file system, writing of files, and then reading some files. The above plot consists of four events, from 0-2s the pod sits idle, from 2-8 seconds I put a file system on the 45 drive RAID0, from 8-22s I write a file to the RAID, from 20-60 is me reading files of the RAID, and from then on it returns back to idle state. You can see that writing files pulls the most current with the average draw nearly double that of steady state, while reading files pulls an average of 21A. · Enterprise Drives should be used in high-availability, always-on applications, since they have design improvements to handle the increased workload (meaning, a high amount of data read from or written to the drive). Consumer class drives are built for lighter use, but still have a place in many systems, mainly applications that don’t see constant everyday read/writes (i.e. personal NAS, large scale cold storage). · Enterprise Drives typically pull more power than consumer drives due to the higher quality electronic & mechanical payload. 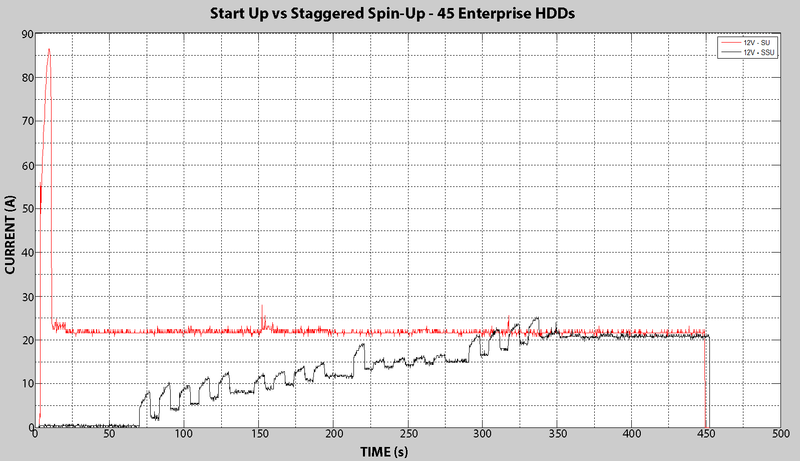 · Staggered spin-up greatly reduces start-up surges and is strongly recommended when starting 45 or more E-class HDDs. The power peaks with and without SSU of 45 E-class HDDs is summarized in the following table. The steady values for the 12V and the 5V line are 21A and 13A, respectively. What do you think? In your own data storage experience, what has worked better for you: E-class drives or C-class drives? Sound off in the comments and let us know.